This weeks news is longer than I usually like it to be, but last Sunday I said that today I would reveal the secret of the 52.19 trillion tally and it requires a few more paragraphs than usual.. Here we go, lol, hang in there with me! Cybersaltine, Mark R., contacted me a couple of weeks ago and offered me trillions of dollars in Zimbabwean currency to help Cybersalt's ministry to persecuted Christians. At first I kind of thought if he pulled my other leg it would play Jingle Bells, but after a bit of back and forth I learned some things and I saw the fun and novelty of his idea for this "Be a Billionaire" fundraiser. What I learned was that in 2008 the inflation rate in Zimbabwe was 79,600,000,000 percent. Yes you read that correctly - 79.6 billion percent! In the midst of that economic environment the Zimbabwean government issued paper currency in denominations of billions and trillions. However, those soon became worthless and were abandoned. 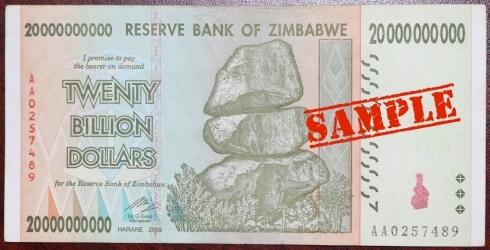 To this day Zimbabwe does not have a national currency. A curious thing happened though: people started collecting these crazy bills as collector and/or novelty items. And that is how I have come to have over 52 trillion worthless dollars sitting next to me as I type this.